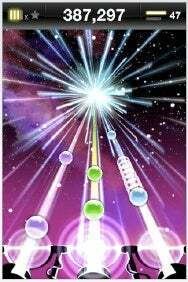 Tapulous has released Tap Tap Revenge 2, a sequel to their best-selling rhythm-based tapping music game for the iPhone and iPod touch. Like its predecessor, Tap Tap Revenge 2 is free. It features more than 150 free tracks, three ways to play with friends, tournaments, contests, and more. Watchmen: Justice Is Coming is an online role playing game based on the movie and graphic novel, where you create your own character and go adventuring through the gritty streets of New York City. $1 for a limited time. Pangea Software has released Otto Matic, a conversion of their popular 3D action game. Otto Matic is set in 1957, in a kitschy b-movie science fiction world that’s being invaded by fleshy-headed aliens who arrive in flying saucers. You’re a robot who has to save Earth from the onslaught. The game, which costs $7, includes 10 levels, seven kinds of weapons and 25 different alien creatures. Following the release of the popular free game Dance Dance Revolution S Lite, Konami has released Dance Dance Revolution S, the full version of the game. It’s priced at $7. It’s the worldwide rhythm music gaming sensation, and this incarnation — especially made for the iPod touch and iPhone — features a selection of hit DDR tunes, cast of characters and “shake” mode that uses the accelerometer. Laminar Research has released yet another evolution of their flight simulator software X-Plane — this time it’s X-Plane Racing, which lets you fly plans through times race courses, against the computer, or against your friends. The game features four regions and four different planes to fly, including an F-15 Eagle, P-51 Mustang, F-4-U Corsair, and F-4 Phantom. $10. Box of Robots has released MP Solitaire, a multiplayer version of the classic card game Solitaire. Two game modes are included beside Klondike, Golf and 13 in the Middle. The game features customizable color schemes, names, card backs and avatars, the ability to resume interrupted games, and bonus points in some modes. $2. Skyworks’ Mental Blocks is a colorful puzzler in the vein of Collapse and reMovem. You have to score as many points as you can by removing colored blocks from the playing grid, by matching blocks of the same color. It costs $2. Another game from Skyworks, Poker Matchup is a game in which you make the best poker hand you can by selecting, sliding and removing cards from two other hands. It also is priced at $2. In 3 Point Hoops Basketball, you have to shoot from nine positions around the three point line, using your finger to flick the ball towards the basket to take a shot. There’s also a sudden death mode, bonus ball, and global high scores board. Priced at $2.